I have wanted to fly over Mt. Hood for a long time. I believe it should be made into a national park. And, comments are being taken by the BIA right now about a proposed casino in Cascade Locks. Background for your comments can easily be found at GorgeFriends.org. Today, I got to fly over these areas and was surprised at how much development is happening in the Gorge and how much clear-cutting is happening around Mt. Hood. It's one thing to take a hike with BARK and see all of the damage in one forest, but the hours we spent in the air provided me with a much broader view. And now I want to share it with you. These photos are public property. If you can find a use for them, have at it. The assumption in your article seems to be that clearcutting is bad and should not occur. There are a number of reasons I disagree with that assumption. First, wood is a renewable resource. You clear cut, you replant, and later you have more wood. Second, as a hunter, I know that many animals prefer to hang out in the clear cut areas. They like the sunshine and the feed that it makes available. Third, oil is running out, which means that a lot of the goods we currently use that are made out of plastic will need to be made of something else. Will it be wood, which is renewable? Or metal that comes from mining (mining - bad)? Or something else? Without oil for fuel, what will we do for energy? Resort to burning logs in the fireplace or rely more on things like coal? Or will we use hydropower - but then you run into the dam problem. My point is, everything we do is messy and has a down side. I think well-managed logging has less of a down side than a lot of other alternatives. I remember once seeing an anti-logging protester collecting signatures on a petition. He was sitting on a wood chair at a wood table on a wood deck in front of a wood building writing with a wood pen on paper. I thought it was rather ironic. Personally, I view forests as crops, save for areas of old growth that are protected and very sensitive areas where logging can cause SERIOUS watershed damage to fish habitat and human water supplies. Other than that, we need to be watchdogs and ensure that our wood farming is done in a responsible manner, with timely replanting. Have you read at all about what's going on in our National Forests? These forests are ours. And, many of us would like to see them left alone so that we can enjoy them. There is plenty of private timber land where multinationals like Weyerhauser can continue to make their $12 billion of profit each year cutting everything in site. 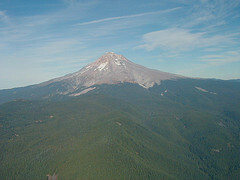 The Mount Hood National Forest and Gorge Scenic Areas are places that 4 million people (tourists, Dollars) and local citizens go each year to recreate. So, I'm hoping to see logging curtailed there, completely. That's my wish. You want some fiber, by the way? How about hemp? Seriously. Also, this cutting is just one symptom of our sick consumptive society which won't go away until we deal with our population problem. This country continues to grow faster than any other industrialized country not to mention that our teen pregnancy rates are highest amongst other developed countries as well. Hope you took a look at the pictures. I don't know whether there is "plenty of private timber land" or not - do I believe agenda-driven environmentalists, agenda-driven multinational logging companies, corrupt government officials, or lazy or biased media? All I know is what I'm paying for lumber. The price would indicate there's not as much of it available as there used to be - or else the demand has increased. Considering how many logging towns have shut down, I'd have to think it's more the former than the latter. As for the forests being ours, and "many of us" wanting them left alone, I would say many of us also would like to see them used productively to produce a renewable resource that we all need. And yes, I do know that's not as simple as it sounds. I also understand the need to preserve tourist assets for the health of the economy. It's all a difficult balancing act being attempted by a lot of ordinary, flawed people. I don't agree that curtailing logging in the Mt. Hood National Forest is a good idea for the reasons I already stated, but obviously that's a debate that's been going on for a long time and will continue for a long time and I'm certainly willing to admit I don't know even half the story. I'm all for hemp for commercial use, by the way. These anti-pot fanatics have thrown the baby out with the bathwater in my opinion. Incidentally, I don't use any drugs at all, so don't anyone go and get excited that I support hemp. Yes, I did look at your pictures. But I think lots of things look worse than they are. Regarding population concerns, yes, we do have a very big population problem - in fact it's an enormous problem. But what do you suggest we do about it? Should we allow people to die when nature seems to be trying to kill them, as we did in New Orleans? Should we have more wars using depleted uranium so people who survive the fighting will die later of cancer, as we have in Iraq? Should we avoid stepping in to stop pandemics so more people will die, as we have with AIDS and now seem to be doing with bird flu? Should we force people to be sterilized as has been done in the past? Should we institute a China-like one child policy? I don't find any of those alternatives acceptable and I doubt anyone else here would, either. The only thing I know of that is acceptable is early education of teenagers about how babies come to exist and how to prevent unwanted pregnancy, as well as ensuring clinics such as Planned Parenthood are safe and readily available (I really deeply don't like abortion, which is why PP's pregnancy prevention is so crucial). But that alone isn't enough. So I think we need to be more creative about energy, consumption, education, food production, etc. - and unfortunately it seems multinational corporations are better at feeding the masses than small farms, even though I share people's grave concerns about pesticides, herbicides, and GM foods. It's all intertwined and complex. I sure as heck don't have the answers - I'm still trying to find out the truth about the factors involved. And good luck with that, too. Who can you trust to tell it like it is? For every fact there's a reasonable argument in opposition. This is why I've moved from fundamentalist to moderate. You can't be a fundamentalist anything without ignoring truth because the world isn't fundamentalist, nature isn't fundamentalist, and life isn't fundamentalist. Sorry about the rambling, but I don't want you to be any more confused about my position than I am! Becky, will review what you're writing when I have a moment. For now, here's an animated map of 30-years of clear-cutting in Cascadia. I hope you've had a chance to see the photos I posted. I've got them in the right order now, and viewing them as a slideshow is pretty quick. "The only thing I know of that is acceptable is early education of teenagers about how babies come to exist and how to prevent unwanted pregnancy, as well as ensuring clinics such as Planned Parenthood are safe and readily available (I really deeply don't like abortion, which is why PP's pregnancy prevention is so crucial)"
Following the Cairo principles agreed to by all nations back in 1994 and re-upped last year would be a great first start. I'll post on this topic soon. Thanks for clarifying, by the way, Becky. I watched the animated clearcutting map and while it shows we are actively logging most of the forests, it doesn't reflect any replanting that has occurred. How soon after logging are these companies replanting? How many years after that does it take for the wood to reach harvestable age? The map would be shocking if those areas are now just clearcuts. But if they're replanted, I really don't have as much of a gut reaction to it. Rather, I want to know more information about how well they're being managed. It's my understanding that the birth rate here in the good old US of A is close to <ahref=http: www.npg.org="" popfacts.htm="">static although western European nations do have a lower birthrate. A lot of the population growth is from immigration (legal and otherwise). As for the "plenty of private timber" argument, you are not answering Becky's requests for documentation. Your aerial tour as an argument, has exactly as much credibility with me as the Fundy Christians pushing "Intelligent Design" because nature is "just too complicated". So too, you can see that clear cutting has occured and you basically don't like to see that. Period. If there were any room in your dogma for sustainability, I might give some credence to your argument. As for the millions of visitors, please take me off of your roll call. I drive up and down the Corridor frequently, because I live here, but (also because I live here) I communicate with "nature" on forest service land, Longview Fiber land, and in my own back yard. As a resident of the area, I can tell you how tearfully grateful we are to get out of our Carharts and boots anad ditch that $20 per hour job. We can now wear Dockers and Rockports and earn $7 per hour cleaning toilets at the Dairy Queen in the Scrumpdilicious Land. I believe that if Mt. Hood National Clear-cut were turned into a National Park, there would be many jobs created. Creating the park, building the new trails, embellishing the campgrounds, perhaps a few new lodges, and then we'd need guides, and yes, maintenance. Hopefully, many of these would pay decent wages. Instead, we're getting continued sprawl around the edges, money-losing clear-cuts and a (hopefully not) new Casino and additional ski-lifts in the area. An important facet of clear cutting is that it undermines the soil integrity of a large area which is caused by a decrease in slope stability and topsoil retention due directly to the loss of trees and other under canopy flora. This erosion has a direct impact on what can grow in that area and down hill from that area due to changes in soil composition. This is important becasue native plants rely on a specific composition in order to grow in that area. Inability for organisms to grow in that area, or worse alien organsisms that take a foot hold in the disrupted soil, purpetuate ongoing ecological disruptions long after the cutting ends. The topsoil of mountains is a thin layer of rich organic matrix mixed with moderate sized basaltic and andesitic grains. Once flora are gone this loosely heald loam moves rapidly down the watershed into the waterways that serve that area and beyond (all the way to ocean in fact). Poor water quality is a serious issue which impacts the entire ecosystem (including us, who pull out water from the very same place). I invite those who endorse the use of clear cutting to research the John Day area to learn about the impact water quality has had on the life within rivers, the organisms within the watershed and on the impact the water quality has had to the communities both personal and ecconomic. Replanting is an important step to mitgating damage caused by clear cutting, however, the ability for a young plants to prevent errosion is impossible when they are not extistent during the entire process of clear cutting when errosion is at it's worst. Additionally, it takes sereval years for young plants to create that supporting matrix during which the loose mountain soil continues to move into the watershed. Using toilet paper to plug a leak isn't the best solution. Also, I find it curious using one questionable activity, hunting, to support another questionable activity, clear cutting. Albert-- Nice post, nice photos, and nice comments. One thing did occur to me - when you let the animations run their course to the present day, you actually see relatively small amounts of recent clearcutting. The Southern Oregon one, for example, is nearly all yellow - indicating clearcuts from 20-30 years ago. The amount of red, recent cuts, is microscopic. Is this really just a policy problem that's already gone away? After all, the Atlas of Oregon reported, the volume of timber production on national forests dropped 90% during the 1990s. In 1988, the Oregon timber harvest was 8.6 billion board feet, with 3.49 billion board feet harvested from national forests and 1.44 billion board feet from BLM acreage. By 1998, the harvest was 3.53 billion board feet. with 333 million board feet from national forests and 122 million board feet from BLM forests. Public lands have essentially been removed from the timber base. Atlas of Oregon, U of O Press, page 74. That is, unless the Bushies have radically cranked things back up - but I haven't heard that that's the case. I'm a little surprised that an Oregonian would find hunting a "questionable activity," but let me explain to you why my husband and I hunt and why our children will begin hunting in the next year or two. Today's commercial meat is full of antibiotics and growth hormones. These commercially raised animals have no quality of life - in fact, many are subjected to horrifying conditions. I prefer to feed my family free range meat. I am a VERY good shot - both my husband and I take it seriously and practice regularly. Every animal I have shot was brought down with a clean shot that dropped it dead in 10 seconds or less without tremendous suffering - very important to me, as an animal lover. If you find this ironic, I can only say that life is full of ironies and we have to make the best choices we can. My husband does our butchering so we don't lose any meat, the animals lived a natural life without dangerous chemicals being pumped into their bodies, we clean up messes we find while we're out hunting, and I know my family is getting healthy food. It's excellent exercise and keeps you in tune with the natural world. If people want to be vegetarian, good for them. I have spent years as a vegetarian, and for my body chemistry I do much better with meat in my diet. I get a little miffed when some self-righteous person who has made different choices call mine "questionable," particularly when I'm a health fanatic who works very hard to make responsible choices for my family. After the rampant clearcutting on federal land during the Reagan and Bush I years, there was not not that much left worth cutting, except what was protected - as in spotted owl habitat. Of course, that makes protection of what is left more critical. I'm not an advocate of no logging, but it takes time for forests to grow, and we started in 1992 with precious little area with big trees. There is no way to recover healthy forests without severe limitation of logging for some time, at least as far as large trees are concerned. There are millions of small overcrowded trees that can be harvested, leaving healthier forests behind. Unfortunately, when the industry, Forest Service and BLM promote thinning, they do it as an excuse to take the big trees that should be left behind. Judging from some of your pics I suspect that much of what you id as USFS land is in fact private land. Can you document that the pics are indeed federal land?